Well appointed villa with garden and superb sea views. The beach at Cala Bianca is 1km. Located near Scopello, the nature reserve at Zingaro is 3km. 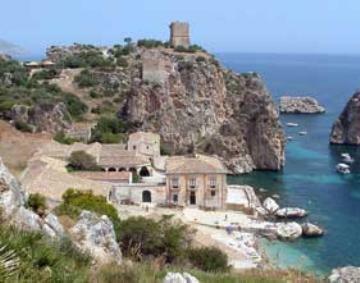 Castellemare del Golfo for shops, bars and restaurants 5km. Palermo airport 55km. The accommodation comprises a living and dining room with open-plan kitchen. Double bedroom (1 x 160cm wide bed) and a twin bedroom (2 x 90cm wide beds). Bathroom with toilet. This is a practical holiday house which benefits from superb views of the sea and the surrounding countryside. Property made available in good order and fully equipped. Local taxes (unless specified otherwise in the villa description), reasonable consumption of services including water, gas and electricity up to the allowance of 100kw per week. Linen and towels (not beach towels) provided. Final cleaning included. Garden and swimming pool maintenance. Saturday arrival 14.00 to 20.00, depart before 10.00. Late arrival supplement 20€ payable locally. Refundable deposit 200€ payable locally in cash. Electricity consumption beyond the allowance of 150kw per week payable locally charged at a rate of 0.50€ per kW.